Smallman Galley is a restaurant incubator in the Strip District that serves as a launch pad and accelerator for chefs, allowing them to showcase their capabilities, hone their craft, and build a following. Inside their space, they have four restaurant concepts, a bar, and a coffee bar. They had been long-time wholesale customers of Commonplace until the Spring of 2017 when they approached us with a familiar question — Would we want to put a shop where their coffee bar was? And we said yes. The Strip District was always an exciting community to us, and we’ve been thrilled to become part of it. Not only have the people who live and work in the Strip District become some of our closest friends, but The Strip has also given us unique access to fresh, interesting ingredients. In that small space, we can develop exciting specialty drinks that we weren’t able to provide in our other spaces. 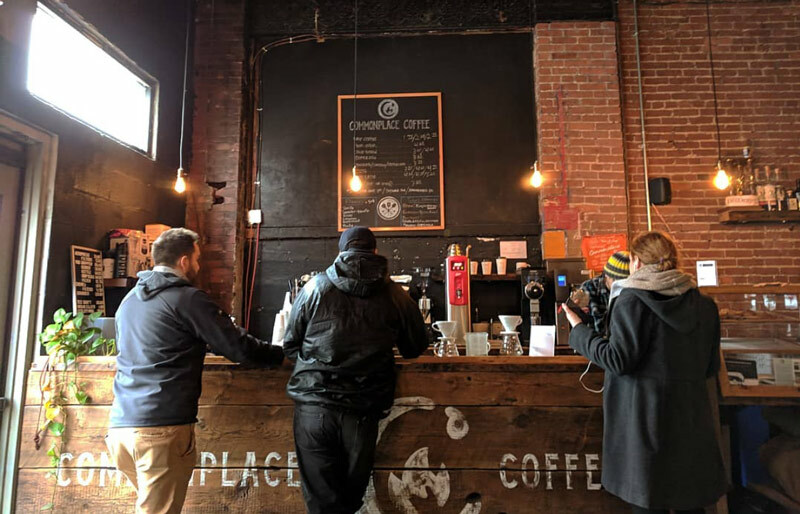 We like to talk about how Commonplace — Smallman Galley is a coffee shop in the morning, as most people know it — nice, quiet atmosphere, good coffee, and a place to spend time. What makes this shop different is that once the restaurants open for lunch, the space transforms with a liveliness we’ve never seen in a coffee-only space. There are smells drifting over from the kitchens, the clinking of dishes, chatter of conversation, and a community that extends beyond the coffee-industry. It’s not your typical coffee shop, and we like that a lot.